Frank Tipler is a mathematical physicist and cosmologist, a professor of Mathematics & Physics at Tulane University, and the author of The Physics of Immortality & The Physics of Christianity. Is the universe open or closed? What does that mean? 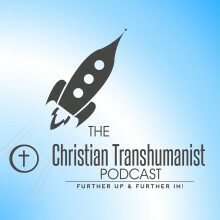 Key distinction: The Technological Singularity, which we frequently discuss on this podcast, is a hypothetical point in the next few decades, where computer processing power exceeds the processing power of the human brain. The Ultimate Singularity discussed by Tipler is a point where the values in physics go to infinity, such as hypothetically might appear in the center of a black hole, or at the beginning of the Big Bang, or (in Tipler's cosmology) at the ultimate end of the universe. Tipler's paraphrase of Romans 8:31: "If the Laws of Physics be for us, who can be against us?" Heaven & hell in the distant future. Hell is the persistent and permanent rejection of life. Dorothy Sayers, hell is closed from the inside. In Tipler's cosmology 3 singularities (points of infinite density) encompass the beginning, middle, and end of all possible universes. Wolfhart Pannenberg on miracles. Miracles are "wonders", executed by God through the laws of physics God decreed. There are not violations of the laws of physics (i.e., God's decrees). John 3:16 reveals the Christian understanding that God decrees things, and absolutely abides by them. Exodus 14:21 — the parting of the Red Sea happened with a great wind. The Bible does not see a contradiction between a miracle and the laws of physics. The book The Great Chain of Being, by Arthur Lovejoy, is the definitive take on this idea. Here's a great drawing of the Great Chain of Being, circa 1579. Moral law and physical law are ultimately joined. The Good, the True, and the Beautiful are ultimately one.